In last week’s post, we looked at the number one thing you’ll need to be successful with your content: consistency. This is a not-so-exciting but very important part of marketing your business and your services that requires clarity on what you’re doing as well as focus and discipline in executing your plan. In fact, that discipline and consistency is part of the broader, not-so-glamorous reality of running your own business that often gets forgotten in the excitement of working for yourself or lost in the pretty pictures that everyone’s sharing on social media. 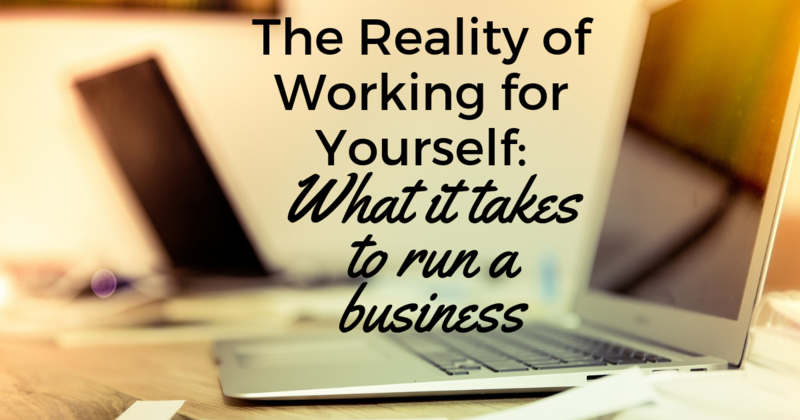 So what is the reality of working for yourself? What does it take to run a business, day in and day out? I believe passionately in creating a business or career around work that you love (and finding a way to get paid by combining this with your skill set along with a bigger mission that embodies what the world actually needs), both for your own personal fulfilment and for having a bigger impact on results for your clients or your employer. However, this doesn’t mean that every day is going to be all fun and games! You will inevitably have to spend time on doing things that you don’t love doing but that must get done for the business – maybe it’s admin, or accounting, or writing proposals – and you need to accept that this as unavoidable when running your own business. As an adult, you’ve most likely settled into a nice comfortable routine where you know what you’re doing, you’re playing within the parameters of what’s appropriate to your experience and skills, and you avoid as much as possible the scary things like presenting to a big audience, networking with people you don’t know, or taking on a project that’s completely outside of your usual scope of work. When you’re running your own business, however, you will always be doing new things and there always be ups and downs in terms of both your confidence and your results. The fear and risk never completely go away and so you’ll need to get used to feeling that little bit uncomfortable most of the time! When you’re in that comfort zone as an adult, there’s an element of prestige and status that comes with having an established career and reputation. It’s hard not to find it both flattering and gratifying to have your ego stroked, whether by your boss who tells you that you’re doing well, your peers, or even strangers you meet at a conference respecting your position and your expertise. Working for yourself, and especially when you’re starting out, you need to accept that there’s a lot you don’t know. You need to put yourself ‘out there’, understand that you will probably face some kind of very public failure as a result, and that you have to be able to ask for help when you (inevitably) need it. As an employee, you have a boss telling you what your work plan is, there’s a set process and rhythm that includes regular meetings and quarterly reviews and so on, and the people and the system around you will keep you going (whether by encouraging you or by coercing you!). You have a team to celebrate with, and the opportunity to be rewarded with a promotion or a salary increase. When you’re on your own, you need to motivate yourself to keep going – even when you’re not (yet) seeing results. Although it’s exciting to have all this freedom and flexibility, the secret to not feeling like you’re lost in the wilderness, and the secret to seeing consistent results, is putting in consistent effort and keeping up that routine and momentum. That’s not easy when you feel like you’re hustling away, alone and in the dark, and with no one to tell you what a great job you’re doing. Working for yourself means that you get to decide when you’re working and what you’re working on. It’s that freedom and flexibility again, to work in your pyjamas at the kitchen table or on the sofa, to work evenings and weekends, and to work as much or as little as you want. As much as you may tell yourself, and others, that you don’t mind working all the time because you love your work so much, the reality is that you’ll burn yourself out if you go too far in blurring those work-life, home-office lines. You need to learn to set your own limits, to decide when you will and won’t be working, and to say “no” to demanding clients and their unreasonable requests – and that’s really not an easy task. Now, of course, it’s not all doom and gloom. If you know me at all and you’ve been part of my community for any length of time, you’ll know that I believe that working for yourself is the absolute best way to create the freedom, flexibility and fulfillment that you so desperately crave in both your life and your business. And there are many different solutions to all these challenges – in setting up your business in the right way, in preparing yourself mentally, in finding a mentor and a supportive community, and in more practical measures like automating and outsourcing. And the good news is that this is exactly what we’ll be looking at in the coming weeks! If you’re looking for a mentor who is a few years ahead of you to help you transition out of the corporate 9 to 5 and into running your own business, then get in touch to book a 30-minute clarity call!